when kids get bored of just being emo, they tend to migrate toward something more chaotic. this is where the brootal character comes in. almost like parasites, they move from one scene to another, draining all originality from that genre before moving onto the next. not sophisticated enough to understand technical metal, and too much of a pansy to hang with the death metal crowd, he hangs with the rest of the brootal kids. as a collective, they have no idea where they are headed. they listen to brootal music not because they have an appreciation or understanding of it, but because it is practically unlistenable. he works on grindcore logos in his notebook all day long, as he aspires to one day design band merch. to show the world his poetic side, he renames himself using alliteration- davey deathkill or stevey suicide, for example. 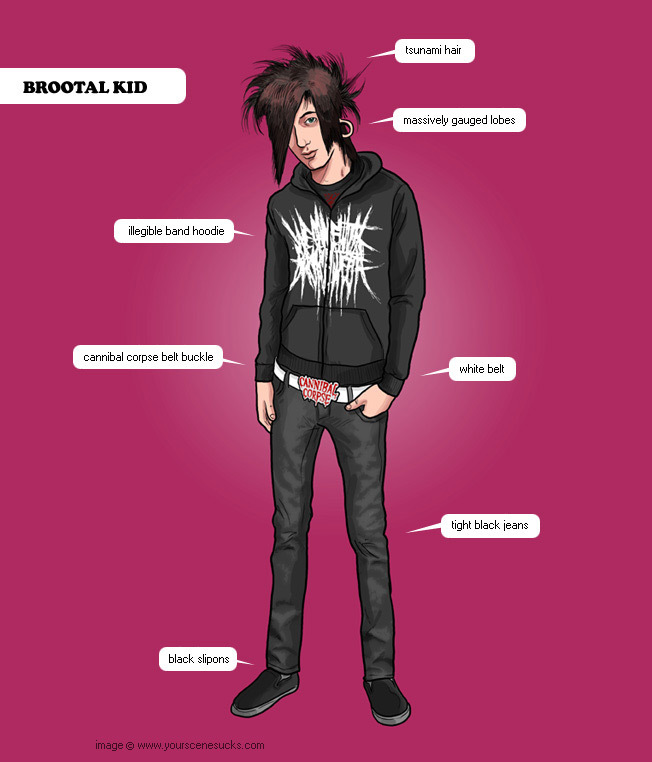 much like the mindless music they listen to, one brootal kid is hard to differentiate from another due to the swarm of white belts and out of control hair.